60+ participants from 22 unique Hosting & AMS service providers across APJ. Focused Run for SAP Solution Manager concentrates on specific needs of high-volume system and application monitoring, alerting and analytics. It is a powerful solution for service providers who are looking at hosting all their customers in one central, scalable, safe and automated environment. It also addresses advanced needs regarding system management, user monitoring, integration monitoring, and configuration & security analytics. Monitoring real user with trace & dynamic correlation; while keeping the cost of operations minimal. The key note speech was followed by a Focused Run Overview session by Dinesh Rao, Vice President, SAP Solution Manager Development, in which he detailed out the scope, use cases, architecture, benefits, and licensing model of Focused Run. Mr. Rao also emphasized on leveraging the native SAP HANA capabilities (like data partitioning, predictive analytics capabilities and so on) by this product. were explained by Resmi KS (Product Owner, Development), Umesh Jagadesh (Solution Architect, APJ Region) & Venkatesh R (Product Owner, Development). The major highlight of the event were the customer reference stories. Mr. Sanket Kelkar, Project Manager(IT), Atos GITSS Pvt. Ltd, India took the audience through the journey of ATOS adopting Focused Run as their central tool for Application Operations to manage thousands of SAP applications across the globe. Mr. Kelkar also explained the ATOS roadmap to onboard all their other customers to Focused Run for Application Operations. Mr. Syed Yousuff & Mr. Rohini Kumar Tatambhatla – Senior Project Managers (IT), Robert Bosch Engineering India; explained the Pilot project for the use from a large customer landscape perspective. They focused on the need to host thousands of SAP Applications which is managed by Focused Run for efficient and steam lined operations. They also detailed adoption roadmap for their scenario. Mr. Nagendra Ashwath –Senior Consultant, Managed Cloud Delivery (MCD), SAP Labs India; took the audience through the challenges of managing 5000+ HEC customer systems for application operations using SAP Solution Manager. Mr. Ashwath explained how MCD project requirements resulted in Focused Run becoming a new Product from the SAP stable. Mr. Ashwath highlighted that 14000+ SAP Applications are being managed by a single Focused Run system for application operations and it is integrated with Nagios & other supporting tools. The last session on the agenda around Partner Certification service enlightened our audience on Outsourcing Operations Providers Certification for Service Providers around the topic of Hosting, SAP HANA, Business Process Outsourcing, Infrastructure, Application Management, and Cloud Services. Post this, the event was open for 1-to-1 discussions for Partners, who were looking at adopting or piloting Focused Run in their environment, with the Product Team. While all the participants from different service providers interacted over hi-tea, a handful of them, who were looking at adopting or piloting Focused Run in their environment in the near future, had a detailed one-on-one discussion with the SAP Product Team. 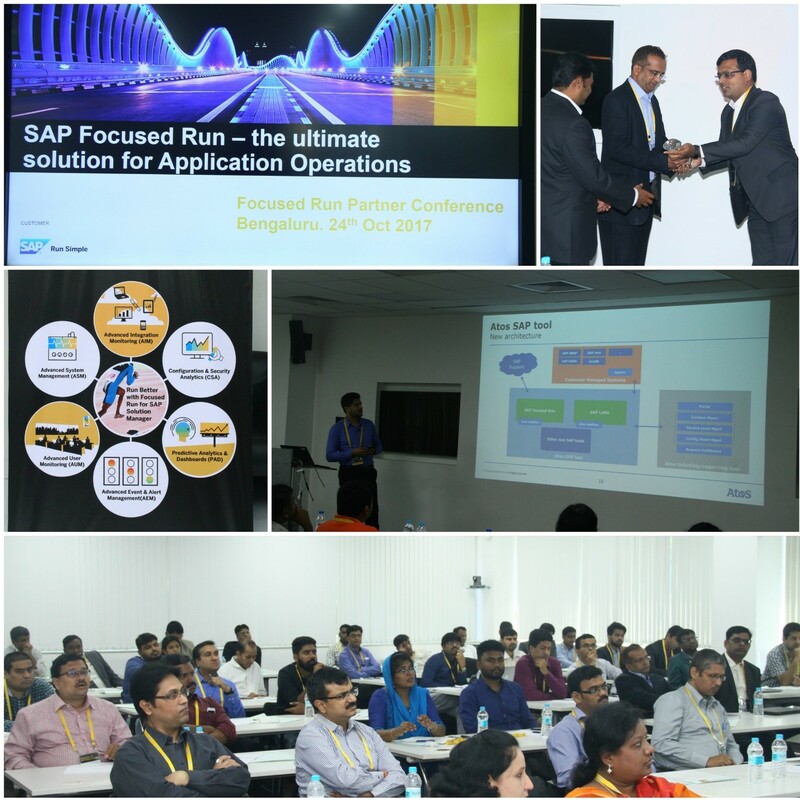 This pre-sales event was organized by the SAP Customer Experience & Solutions (CXS) organization to spread awareness about Focused Run product in the Indian partner community, especially hosting and AMS partners. Focused Run is the Ultimate Solution for Application Operations. To know more about Focused Run for SAP Solution Manager click here. Run Better with Focused Run for SAP Solution Manager.